Three years ago architect Bob Borson decided to start a blog “as a creative outlet” and “to try something new”. Little did he know that within two years his blog would balloon to readership of over 250,000 views a month, making it one of the most visited blogs of an individual architect. As such, Bob has become a voice for architects as read by thousands of people. Bob's experience has lessons for those who wish to use the internet to find the right clients and use the power of the internet for marketing an architecture firm. We discuss Facebook, Twitter, blogging and other social media for architects. We also discusses how his firm survived the recession, how he finds new clients as an architect, why he started a blog, and marketing for architects. On his blog, Life of an Architect, Bob writes about life through the lens of an architect. 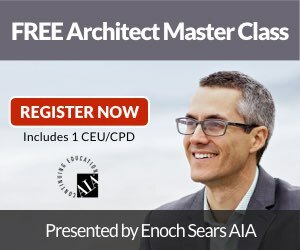 Some of his most popular posts cover subjects such as the reasons to be an architect, the reasons not to be an architect, how much money an architect makes and the salary of an architect, and the communication skills needed by architects. You can read more at his blog Life of an Architect. And last but not least, scroll to the bottom of this page to leave your comment about this episode. What do you think about what Bob shares? Hi!…….Bob, Thanks for writing such an amazing article. I like your views about architecture.I must say you are a very best architect. Thanks a lot for the helpful information. I really did enjoy this interview with Bob. His commitment and enthusiasm for his craft is infectious. I think he did hit the nail on the head when he stressed that it is the Mindset and working with people that Aces the hole. I too have found the sources of satisfaction in my practice and many of them has to do with either the end result or target points where I can gauge client’s receptiveness and collaborators will and enthusiasm, and these usually trumps the perfect design every time. There is a certain ‘purple’ feeling that comes with knowing that the thing was resolved rightly, even though it involved a lot of boring and mundane tasks, and the people involved are proud of the achievement. Sometimes the ‘practice’ of architecture can be an onerous task, and sometimes the ‘perfect’ of architecture is a joy. One brings the other, and in order to bring about the ‘perfecting’ of architecture one has to keep ‘practicing’ the thing.